A Donna Hay classic. I have always looked at her site, stared aimlessly at the gorgeous photos but never actually made one of her recipes. So this is my first of hopefully many. It turned out wonderful tasting. My candied lemons did not stay whole like hers did in the photos. The centers of mine fell apart and looked a bit rugged. I will have to figure out how to retain the 'prettiness' while candying lemon slices. 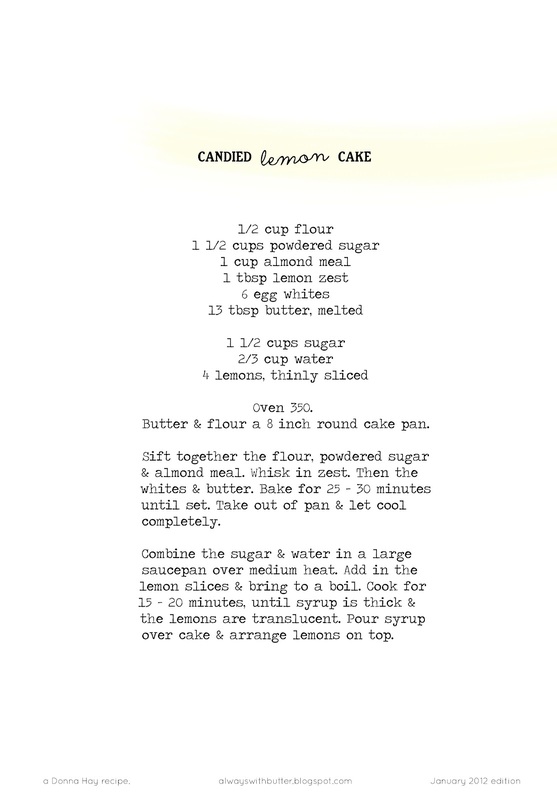 The remaining syrup from candying the lemons gets brushed atop the cake before placing the slices. This is what makes this cake special. The sticky, gooey ultra tart syrup makes the cake amazingly moist. If you keep brushing it on, layer after layer, once it absorbs, it will seep all the way to the bottom. Making a super sticky cake with the chewy lemon slices on top. It's great. And this comes from someone who works with cake everyday and is beginning to hate the taste of them. Donna Hay does it right. *I was getting my ear pierced the other week. So while walking right in front of the tattoo parlor I was about to go in, with big glass windows, I trip. Not just a normal stumble kind of trip. A fall to the floor, rip the knees in your pants, get gigantic bruises on your legs, trip. So already feeling to awkward going into the shop, where they all look so tough and badass, and little blonde me, this would just be a typical thing that happens to me. They all saw. I knew I had to say something because it's not something you can just play that off. So of course I walk and loudly proclaim 'Bet y'all saw me fall?!' in a sarcastic voice, trying to break the tension. Then no one said anything. So yes, I can generally make a whole room feel awkward in a matter of seconds. *I generally buy all my clothes at Marshalls, I love it there. *You can tell me your name and 5 minutes later I have no clue what you said. *But I will remember the most minuet detail that someone told me years ago. *I love cheese but have a growing fear that I am somewhat lactose intolerant. *I drive a 'soccer mom' mini van. *I have bleached my eyebrows before. I loved it but everyone thought I looked like an alien. *Whenever I buy shoes, people generally feel the need to tell me how big my feet are. I'm 5'5 and wear a 9 or 10. *I think the Kinfolk Magazine videos they post online are the most beautiful films ever. I watch them over and over. *I still live with my parents. I'm 24. *I have dyed my hair probably every color you can imagine. *I always wear high heels to Costco. Gotta make some part of shopping in a warehouse classy. *I play backgammon on my phone all the time. *I have one song on the iPhone. Someone like you by Adele. *I have had an old pallet on my front porch for probably 6 months now that I have been meaning to break down and make into a photo background. *I took hundreds of photos of my old boyfriend. All of my photo albums are currently at the back of my closet, hiding in the darkness. Ok, do you feel you know a bit more about me know? Well random facts about me anyways, hope you found it somewhat amusing. Valentines Day is one week away. Dreading it. It is the worst holiday for a single girl who has had her heart trampled on by two guys in the past 3 months. So you will see no cutesy desserts from me. Sorry guys, my heart shaped pans are staying securely where they are. Thanks for sharing a bit of yourself (well, lots of bits) so openly. I've always felt that V-day was a super cheesy holiday and in my single girl days, I dreaded it, until I started looking at it as an opportunity to do cute/fun things with my friends. My girlfriends and I would send each other packages and cards, and somehow, I look back and think how much I loved to hate V-day, but kinda liked it anyway. I feel the same way when I see young girls in tank tops when it's cold out. It ain't worth it! haha. Gorgeous photos, as always! I wear a 9 or a 10 too. I am so glad to find another short girl with something other than a size 7 foot. I also am glad to find this amazing candied lemon cake! So pretty! Well I commend you, all my photo albums with pictures of my old boyfriend didn't make it to the back of my closet... they made it to the trash can instead... (in pieces). Your cake looks beautiful and delicious! Ah! It drives me crazy when I see middle schoolers walking around without coats or sweaters too! So ridiculous. I work as a student teacher so it's something I'm faced with daily. I turned 25 last week and lived with my parents until I was 24. It was one of those things that I didn't want to move out until I knew I was financially stable enough to not have to move back. This cake looks so lovely. There is something about citrus that is just so so beautiful. I love this post, and I love hearing little snippets about bloggers that I follow.. it makes them even more real and fascinating. I too have pieces of wood sitting outside my door, waiting to become photo backdrops. Just can't be bothered doing anything with it right now..
donna hay = one of my all-time favourite food stylistts! Plus she's Australian woohoo! 1. I fall over more frequently than anyone I know. I like to think I'm quite an expert. So take it from me, if you were only embarassed (and not bleeding, for example), you're doing OK.
2. Donna Hay is awesome. And yes, australian! hurrah! Hope you enjoy her recipes. 3. Potentially being lactose intolerant is a terrible thought. I plan to never go to a dietician thingy if I can avoid it so I never have to find out that all the things I love I'm allergic / intolerant to. 4. Valentines day - pah! Who needs heart-shaped pans anyway? Your average pans are clearly beautiful enough. One day, I'll send a valentine to myself, and then I'll truly be happy because I won't need to depend on anyone else. Love from anyone else is just be a bonus! I am so glad I'm not alone in hiding from photos of an ex. I somewhat enthusiastically transfered all my files from my old computer to my new one in the hope of finally organising them (which at close to 30,000 is a task and a half). After a few minutes browsing I remembered the reason I hadn't done it before was the five years worth of photos of my ex and I looking blissfully happy, the task was abandoned immediately. i've just discovered your blog and felt in love with it totally... beautiful pictures and great recipes! wow, this is beautiful and looks delicious! "SLAP!" "SLAP!" to the two guys! Oh how I love that shot of the fingers, black nail varnish and all, doing the sprinkling! I really enjoy your blog which I discovered a few weeks ago! The pictures are just beautiful and mouhwatering! Exactly the kind that I love to see in rare cookbooks or food magazines. You have great aesthetic view! I love these little insights into your life to accompany a cake which pretty much speaks for itself. Donna Hay recipes are wonderful and you've definitely done her justice with your gorgeous photos. I've made that recipe and had the same issue with the lemon slices. Athena: Glad it made it too you! Nice, I hadn't heard about that signing yet. I'll have to look it up, hopefully see you there! Greek MPs debate an unpopular austerity bill crucial for a 130bn euro bailout, as police use tear gas against angry protesters outside parliament. Great post and glad to here you have cooked your inaugural Donna Hay Recipe. You have to try her brownies! Yum, yum, yum. i just wanted to say that i LOVE your blog. 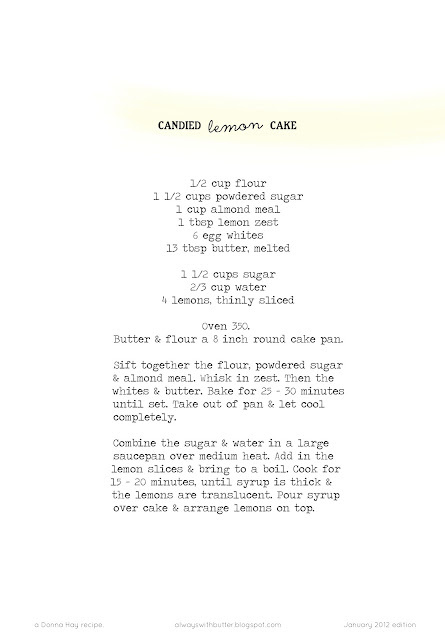 i must have been looking at it way too much bc i just realized that subconsciously, i imitated the way you wrote candied lemon cake on the cover photograph of this post. you are such an inspiration though! I really like Donna Hay recipes. Simple and tasty. Adele is amazing and if I were to have only one song on my phone it would be "Someone Like You" too! Just watched her DVD "Live at the Royal Albert Hall". Brilliant. I'm happy to have found your blog. Thank you Pinterest!